The University of Rochester Laser Energetics Lab is looking for talented high school juniors for their Laser Energetics Lab summer internship program. The good folks at Syracuse Universityare offering a three week QuarkNet course this summer, and they would like to get the word out about it. Dr. Steve Blusk (a B-meson researcher) is heading up the endeavor, with help from several other professors, including an expert in neutrino research. Ranald Bleakley (Weedsport High School) and Joshua Buchman (Fayetteville-Manlius High School) have been working with them all to help make sure that the course will be extremely beneficial to high school teachers. The program is likely to be offered for the next several summers, so it would be great to let people know this will be available. The course will involve lectures on particle physics and particle physics research, lots of Q and A, fantastic lab experiences related to particle physics research, and a three-day detector seminar by Tom Jordan from QuarkNet. Thanks to the RIT Physics Department for hosting RAPTOR. Steve Whitman is working with SUNY Brockport on programs for high school physics teachers to implement Interactive Physics effectively in their classrooms. STANYS-CWS is also working to network and build collaboration. Get involved! Dan Fullerton (Irondequoit High School Physics) gave a presentation on a developing outreach program at RIT intent on Integrating Semiconductor and Microelectronics in High School Science Courses. Effort is being developed by Dan Fullerton, Mike Jackson, and Tom Schulte. Course materials are available on APlusPhysics.com. He also shared information about the school’s PREP program, then went into his technical presentation titled The Manly Man’s Guide to the Universe: The intimate relationship between the VERY big and the VERY small. The U of R PREP Program (Pre-college Experience in Physics) is a free three-week summer program for 9th and 10th grade women without previous physics experience. The program runs weekdays from 9 am to 3 p.m., featuring speakers, demonstrations, tours, lectures, projects, and social activities. The program is designed to be fun and enriching, and fosters opportunities for attendees to build a peer group (and is not designed as an AP-B prep program). More information is available by contacting Connie Jones . Particle Physics, The Standard Model, Cosmology, the Big Bang, and how they tie together. ImagineRIT May 5 — demonstrations and activities across campus. Next RAPTOR meeting May 12 from 9 am to noon at RIT (Science Bldg, 4th Floor). I had the privilege of attending the Rochester Area Physics Teachers Out-Reach (RAPTOR) meeting at Rochester Institute of Technology on Saturday, Jan. 14, from 9 a.m. to noon. With more than 20 physics instructors in attendance, I was thrilled to meet many great teachers, reconnect with old friends, and walk away with a bunch of new ideas and resources. The meeting began with some collegial discussions and socialization, followed by introductions — introductions of both the RAPTOR association itself, and of the individuals in the room. RAPTOR is a group of physics teachers centered in the Rochester area focused on sharing ideas, demonstrations, discussing concerns, issues, and solutions, with the goal of improving physics teaching and learning for all involved. Brendan Noon has created a WIKI depository for teaching materials at newyorkphysics.wikispaces.com. Special thanks to the RIT physics department for hosting us on a Saturday morning! Tom Frys provided information on the annual High School Model Bridge Contests. These are held each year in conjunction with National Engineers Week, and are quite popular both in Syracuse and Buffalo. Interest is developing in Rochester to expand the program locally as well. Examples of bridges were presented, as well as design specifications. Organizers are very willing to work with the RAPTOR teachers to make the event a success in the area. Dan Fullerton talked about APlusPhysics.com and the Regents Physics Essentials book. In addition to highlighting what resources were available, I tried to focus on showing ways in which these resources could be utilized in a classroom to provide differentiated and personalized instruction outside of class, leaving more valuable classroom time for active learning, exploration, and instructor assistance. I also presented an example of how Regents Physics Essentials and APlusPhysics are used at Irondequoit High School to streamline mid-term and end-of-year review activities. 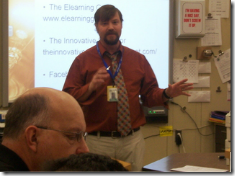 Brendan Noon then presented on Planning a Differentiated Lesson w/ Game Show Review. Following the style of Jeopardy, students create their own review game shows. This can be implemented in a wide variety of ways, but leaves many options available for differentiating by level of Regents questions, assigning higher level questions to higher level students, and also assigning less frequently found topics to higher level students, while maintaining heterogeneous class groupings. Recommendations included having all students answer all questions (check by whiteboard presentations). It was also noted that TestWizard contains quiz functionality (even if many of the solutions are incorrect and need to be checked in advance.) Following the meeting, I noted in a recent catalog from the AcademicSuperstore that Jeopardy-style classroom equipment is still being sold. Next up was a discussion of the Common Core Standards and Assessments, and the wide range of ways they are being presented and implemented in physics classrooms. Brendan Noon began the discussion by highlighting data showing statewide graduation rates are up, though college readiness has not increased. This has led to xix shifts in ELA/Literacy and six shifts in mathematics. Highlighting key shifts, ELA shift 1 deals with applying strategies to reading information text, teaching strategies for informational texts, and scaffolding for difficulties. Noon shared a Buffalo State “Reading Log” format for physics, which covers the NY State / Common Core standards. Students diagnose their own vocabulary, interpretations, question themselves, re-read, graph/diagram, etc. These are typically assigned as homework, and at Buff State, are graded on a five point scale, with five points for completing them correctly the only rubric required. There is a big focus on getting students to use textbooks at some level. Schools have been given money specifically targeted for textbooks (and only textbooks). Schools can also document the use of this money as part of their School Improvement Plan reports. ELA Shift 2 deals with handling primary source documents with confidence. Many see the text itself as a source of evidence, but it’s also possible to use a wide variety of sources such as websites, fiction and non-fiction books, and even popular magazines as sources. Further, it’s quite possible to use different interpretation levels within the same texts as well as different texts with different interpretation levels to differentiate student expectations. The ultimate goal is to stop referring to and summarizing texts, and teachign students to start reading and understanding as we build a community of independent learners. Text can be words, data, or arguments. A great source for these types of questions is ACT review books with science passages — it’s easy to add one of these to the end of a test for practice and help students build these skills throughout the year. Next was a sharing/discussion session to close out the meeting. One member demonstrates applications and demonstrations of falling discs and gyroscopes, another showed a quick demonstration to build thinking about conservation of energy and magnetism, yet another discussed challenges and experiences teaching in an urban environment. Members discussed how RAPTOR should be a terrific resource for new teachers as well as more experienced instructors. Steve Whitman talked about the use of Interactive Physics as a classroom resource, providing several demonstrations and discussing potential for further development of teacher training and supporting resources through a grant with SUNY Brockport. Meeting closed with distribution of a number of terrific door prizes! The first 2012 meeting of the Rochester Area Physics Teachers Out-Reach group (R.A.P.T.O.R.) will be held on Saturday morning, January 14, 2012, from 9:00 a.m. to noon. The meeting will be located in room 3335 of the Gosnell building, Building 8 on the campus of the Rochester Institute of Technology (http://maps.rit.edu/). Park in Lot U. There is NO restricted parking on weekends so park at north end, closest to buildings. We start with refreshments, socializing, and introductions. There are many physics high school teachers new to R.A.P.T.O.R. the meeting provides opportunities for them, as well as for veterans, to communicate with each other. Thomas Frys (Association for Bridge Construction and Design Board Member) will discuss the possibility of involving Rochester Area high school science students in the annual ABCD Model Bridge Competitions. Dan Fullerton (West Irondequoit High School) will give a brief presentation on the APlusPhysics.com web resource and how it can be coupled with a novel approach to Regents Physics review. Guided by the principle "The best review book is the one students will actually use," Fullerton gathered input from a range of teachers and students to write "The APlusPhysics Guide to Regents Physics Essentials." His presentation will focus on utilizing these resources to enhance instruction and support students in a hands-on, interactive, highly constructivist learning environment. Brendan Noon (Williamson High School) will discuss using “Game Show Review” as a differentiated source of learning engagement. Students actively participate in collecting questions from past regents exams and preparing “Game Show” style Power Point reviews and video presentations for their peers to compete against each other as contestants. Lesson plan templates and sample Power Points will be demonstrated and distributed during this presentation. Next, Brendan Noon (Williamson High School) will lead a discussion on the critical components involved in constructing physics units aligned to New York State’s Common Core Standards shifts and how these shifts will impact New York State assessments. He will show the framework used in developing a Unit on Modern Physics and discuss how this framework can be used in developing other units aligned with Common Core Standards Shifts. The last scheduled item is Sharing. This is a half hour devoted to unscheduled presentations by any participant, of duration between, say, three to ten minutes. It could, for example, be a demonstration, a lab experiment, a way of presenting a topic, a thought on pedagogy, or humor. Miscellaneous: Parking is available in Parking Lot U . There are no costs or fees associated with any part of this meeting and it is not necessary to make a reservation in advance. If you would like a letter of attendance for this meeting please inform me ahead of time so that it can be distributed at the meeting. The agenda is repeated in capsule form at the end of this message. 9:20 – 9:40 a.m. Physics Demos that make Students Think! The Rochester Area Physics Teacher’s Out Reach (RAPTOR) will hold its first meeting of 2012 at the Rochester Institute of Technology on Saturday, January 14th from 9 am-noon EST. Physics education enthusiasts all over the world are welcome to attend this meeting live via this link. The meeting will feature a presentation by Dan Fullerton, author of Regents Physics Essentials, Honors Physics Essentials, and developer of APlusPhysics.com, as well as a presentation and discussion centered around physics lessons addressing New York’s Common Core State Standards and how these changes will affect physics education. Come for the free donuts and stay for the demos, and if you can’t attend in person, join us online! Special thanks to Brendan Noon of Science With Mr. Noon for organizing this event. 9:15 – 9:35 a.m. Physics Demos that make Students Think! RIT has a nice interactive map at: http://maps.rit.edu/ If you search “Gosnell building, Building 8” it will pinpoint the location and show a photo. The Room # is 3335.